Talk of the Devil is a collection of rarely-seen journalism and other writing by Ian Fleming. It belongs to a special edition of his complete works published in 2008 by Queen Anne Press to commemorate the centenary of his birth. The edition is intended to celebrate Fleming not only as the creator of Bond but as an accomplished and vivid journalist, distinguished bibliophile and literary publisher. No uniform edition of Fleming’s complete works has appeared before. 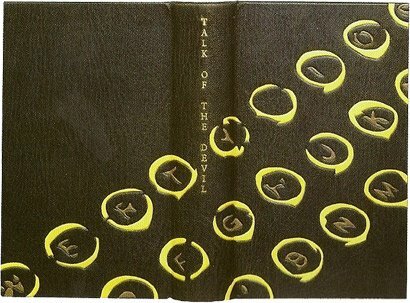 Talk of the Devil, the last of eighteen volumes, is edited by his niece Kate Grimond and nephew Fergus Fleming. Talk of the Devil is a collection of rarely seen material, some of it unpublished. The contents are mainly journalistic but they also include two short stories. One of them, A Poor Man Escapes, is Ian’s earliest known attempt at fiction. The other, The Shameful Dream, was written in 1951 and has as its hero a journalist named Bone – a year and a letter-change later the hero would be Bond. The book is restricted currently to the Centenary Edition but it will be available as a single volume sometime in the future. In preparing this volume our goal has not been to assemble every overlooked scrap of Ian Fleming’s writing, far less to make a definitive collection of his journalism. Instead we have tried to create a book that does justice to its author. The contents have been selected for their rarity, their historical and biographical value and the glimpses they give of his opinions and enthusiasms. Our overriding policy has been that they should be of interest and entertainment. A few items have never been published, others have already appeared in print – as, for example, the articles that Ian Fleming wrote during his long association with the Sunday Times. In the latter case we have followed the original typescript rather than the published version, and where good lines were edited out we have put them back in. The title is taken from a notebook in which Fleming listed names and phrases that caught his fancy. Talk of the Devil, was also an early title contender for Diamonds Are Forever. Other notable entries pre-dating Bond include an eye-witness account of the 1942 Dieppe Raid; Fleming’s “Memorandum to Colonel Donovan” which laid down administrative practice for the Office of Strategic Studies (O.S.S. ), predecessor to the C.I.A. ; his contribution as Foreign Editor to the Kemsley Manual of Journalism; and a description of Jamaica in 1947.